Ten years after the publication of the paper edition of the Catalogo ragionato della scultura (Skira 2007), the entire archival activity of Pomodoro's oeuvre has been transformed into an ongoing project that, starting with sculpture, aims to document all aspects of his work: drawings, multiples, jewels, graphic designs, project studies, applied arts and set designs. The updates acquired by the archive, already included in the 2007 paper edition, together with the most recent information, in addition to the documentation of the other areas of research, were firstly destined to a new updated publication. However, it was decided that an online publication was the perfect way to address in a problematically lively account of the richness and complexity of Pomodoro's work, in line with the very nature of the archiving work, which for many years has been based on systematic forms of digitization. 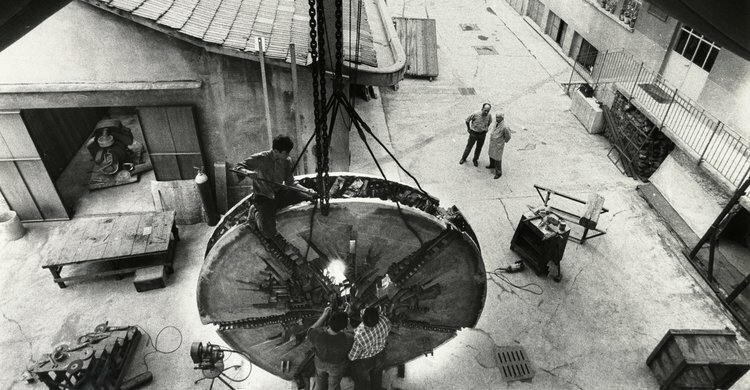 The project, run by the Fondazione Arnaldo Pomodoro, is expected to continue developing for many years entrusted to the long-term staff of the Pomodoro Archive, with scientific coordination of the artist himself, alongside the Catalogo ragionato della scultura. Data management is based on a structured and highly personalized program in Filemaker, which has been specially created by the Fondazione, in collaboration with Officinebit.ch. wealth of photographic and bibliographic documentation, which also includes a wide range of historical documents that are difficult to find. enhance the extraordinary paper and photographic resources entrusted to the artist's archive, managed by the Fondazione, that is currently undergoing scientific sorting and cataloging. General public, who can research to any level of detail. The Fondazione Arnaldo Pomodoro has therefore chosen to develop a highly innovative model aimed at creating an immediate, up-to-date and precise consultation tool and to develop a body of work in progress that refers to Arnaldo Pomodoro’s whole artistic career and his specific working method.